For other uses, see Kendal (disambiguation). Kendal, known earlier as Kirkby in Kendal or Kirkby Kendal, is a market town and civil parish within the South Lakeland District of Cumbria, England. Historically in Westmorland, it is situated about 8 miles (13 km) south-east of Windermere, 19 miles (31 km) north of Lancaster, 23 miles (37 km) north-east of Barrow-in-Furness and 38 miles (61 km) north-west of Skipton. The town lies in the valley or "dale" of the River Kent, from which it derives its name, and has a total resident population of 28,586, making it the third largest settlement in Cumbria behind Carlisle and Barrow-in-Furness. Kendal today is known largely as a centre for tourism, as the home of Kendal mint cake, and as a producer of pipe tobacco and tobacco snuff. Its buildings, mostly constructed with the local grey limestone, have earned it the nickname Auld Grey Town. Kendal is listed in the Domesday Book as part of Yorkshire with the name Cherchebi. For many centuries it was called Kirkbie Kendal, meaning "village with a church in the valley of the River Kent". The earliest castle was a Norman motte and bailey (now located on the west side of the town) when the settlement went under the name of Kirkbie Strickland. A chartered market town, the centre of Kendal is structured around a high street with fortified alleyways, known locally as yards, off to either side, which allowed the local population to seek shelter from the Anglo-Scottish raiders known as the Border Reivers. The main industry in those times was the manufacture of woollen goods, whose importance is reflected in the town's coat of arms and in its Latin motto Pannus mihi panis, meaning "cloth is my bread." "Kendal Green" was a hard-wearing wool-based fabric specific to the local manufacturing process. It was supposedly sported by the Kendalian archers who were instrumental in the English victory over the French at the Battle of Agincourt. Kendal Green was also worn by slaves in the Americas and is mentioned in songs and literature from that time. It is noted by Shakespeare as the colour of clothing worn by foresters (Henry IV, Part 1). Kendal Castle has a long history as a stronghold, built on the site of several successive ruined castles, the most recent being from the late 12th century. It was the castle of the Barony of Kendal, the part of Westmoreland ruled from here. The castle is best known as the home of the Parr family, who represent one of the lines of heirs of these barons. The Parrs inherited the castle through marriage, in the reign of Edward III of England. Rumours still circulate that King Henry VIII's sixth wife Catherine Parr was born at Kendal Castle, but based on the evidence available this is unlikely: by the time Catherine was born, the castle was beyond repair and her father was already based in Blackfriars, London, at the court of King Henry VIII. A Roman fort existed about 2 miles south of the present-day town centre, at a site known as Watercrook. It was built in about AD 90, originally as a timber structure, and then rebuilt with stone in about 130, during the reign of Hadrian. The fort was abandoned for about 20 years during the Antonine re-occupation of Scotland. It was then rebuilt during the reign of Marcus Aurelius and occupied until about 270. That was probably the last time it served military purposes. What remains of the stone structure is now buried under a field. Many of the Roman artefacts from the site may be found in the Kendal museum. The Roman site was built on a pre-existing Iron Age fort. Early travellers to Kendal complained of eight miles of "nothing but a confused mixture of Rockes and Boggs." Riding horseback was the fastest form of travelling for the road was "no better than the roughest fell tracks on high ground and spongy, miry tracks in the vallies." It became evident that it was unjust and beyond the power of the thinly scattered rural population thereabouts to be called upon to maintain a road used for through traffic. "Whereas the road is very ruinous, and some parts thereof almost impassable and could not, by the ordinary course appointed by the Laws then in being for repairing the highways, be amended and kept in good repair, unless some further provision was made." In 1703 by Order of the Quarter Sessions of the Barony of Kendall the surveyors of highways was to make the roads good and sufficient for the passage of coaches, carts and carriages. In 1753 The Keighley and Kendal Turnpike brought the stage coach from Yorkshire to Kendal. Kendal is known for Kendal mint cake, a glucose-based type of confectionery reputedly discovered accidentally by Joseph Wiper during his search for a clear glacier mint. Used on numerous expeditions to mountaintops (including Mount Everest and K2) and both poles of the Earth, its popularity is mainly due to the very astute decision of the original manufacturer's great-nephew to market it as an energy food, and to supply Ernest Shackleton's 1914–1917 Trans-Antarctic Expedition. By the time the business was sold to competitor Romney's in 1987 there were several rival mint cake producers, many of which are still in business. Snuff production in Kendal dates from 1792, when Kendalian Thomas Harrison returned from Glasgow, Scotland, where he had learned the art of snuff manufacture. He also brought with him 50 tons of second-hand equipment, all carried on horse back. Pipe tobacco and other tobacco products were subsequently added to the firm's production. Ownership of his firm passed eventually to his son-in-law, Samuel Gawith, whose eponymic firm, Samuel Gawith & Co., continues in business to this day. Following Samuel Gawith's death in 1865, the firm passed into the hands of his two eldest sons. During this time the business was administered initially by trustees, including Henry Hoggarth, and John Thomas Illingworth. Illingworth left the firm in 1867 to start his own firm, which remained in business until the 1980s. The youngest son of Samuel Gawith the First subsequently teamed with Henry Hoggarth to form Gawith Hoggarth TT, Ltd. Both Samuel Gawith & Company and Gawith Hoggarth TT continue in business today in Kendal, producing snuffs and tobacco products still used around the world. Samuel Gawith and Company also hold the distinction of employing the oldest piece of industrial equipment still in production use in the world, a device manufactured in the 1750s. The municipal borough of Kendal was created in 1835 and until 1894 the town was also an urban sanitary district. The borough boundaries were altered in 1935 under a County Review Order to include a small part of South Westmorland Rural District. The civil parishes of Kirkland and Nether Graveship became in 1908 part of Kendal Civil Parish, whose boundaries thereafter were the same as the borough's. From 1888 to 1974, Kendal was the centre of the administrative county of Westmorland, although Appleby was the traditional county town. The borough of Kendal was abolished in 1974 under the Local Government Act 1972, becoming part of the South Lakeland district of Cumbria. The town was a successor parish, and so kept its own town council. Kendal is part of the Westmorland and Lonsdale parliamentary constituency, of which Tim Farron is the current MP representing the Liberal Democrats. Kendal stands on the River Kent, surrounded by low hills. It is near, but not in the Lake District National Park formed in 1951, which was shaped to exclude the town. Although relatively small, its rural location makes it an important commercial centre for a wide area. It is sometimes dubbed "The Gateway to The Lakes". Kendal has a marine west coast climate, category Cfb on the Köppen Climate Classification. It has moderately warm summers and mild winters, with precipitation at all times of year. In July and August the average daily maximum and minimum are 19C and 11C respectively. The corresponding averages in January and February are 6C and 1C. Kendal's early prosperity was based largely on cloth manufacture. In the 19th century it became a centre for the manufacture of snuff and shoes; the K Shoes company remained a major employer in the town until its factory closed in 2003. There are still a number of industries based in the town, such as Gilbert Gilkes & Gordon (manufacturers of pumps and turbines), James Cropper paper makers (based in Burneside and who make, at no profit, the paper for the Remembrance poppies for The Royal British Legion), Mardix (switchgear), Lakeland and Kendal Nutricare, who have a facility making baby milk in the north of the town. Tourism is now one of the main employers, but there is also a significant IT and design sector in the town, enabled by increased broadband availability. On 26 February 2003 Kendal was granted Fairtrade Town status. Kendal railway station is situated on the Windermere Branch Line and gives connections to Windermere railway station to the north, and Oxenholme Lake District railway station (on the West Coast Main Line) and Lancaster railway station to the south. Kendal is around 8 miles (12 km) from the M6 motorway, and is bypassed on the west by the A591 road, linking it to Windermere, Keswick and the A590 leading to Barrow, as well as being the terminus of the A65 road to Kirkby Lonsdale, Skipton and Yorkshire and a destination on the A6 road to Penrith. Kendal is signposted off the M6 at Junctions 36 (A65, A590), Junction 37 (A684 road), Junction 38 (A685 road) and Junction 39 (A6). The three-mile £1.9m A591 bypass opened on 29 August 1971. The Lancaster Canal was built as far as Kendal in 1819, but the northern section was rendered unnavigable by the construction of the M6. Part of this section was also drained and filled in to prevent leakage, and the course of the canal through Kendal has now been developed. The canal towpath, however, remains as a footpath through Kendal. A campaign is currently underway to restore the canal as far as Kendal. Kendal has a daily coach service to London. Local buses from the bus station serve destinations such as Ambleside, Barrow-in-Furness and Lancaster. The Queen Katherine School, on Appleby Road, is a secondary school with academy status. The school also has a sixth form. Kirkbie Kendal School, formerly Kendal Grammar School, is a secondary school Business and Enterprise College that serves the area around the town and rural countryside. It operates as a foundation school with academy status; its previous pupils include the historian David Starkey and clinical psychologist Vanessa Jones. Kendal College is a further education college that provides further and higher education, as well as training for employers. The college is judged outstanding by Ofsted, has over 4,000 students and employs over 150 staff. There are numerous primary schools in the area, including Castle Park, Stramongate School, Heron Hill, Ghyllside, Vicarage Park, St Thomas's and Dean Gibson. In the nearby village of Natland, there is St Mark's School. Holy Trinity Church which includes the Parr Chapel and Prayers written by the hand of Queen Catherine Parr. Kendal Museum – one of the oldest in the country, it includes exhibits on area history, culture, archaeology, geology, local and world natural history, Roman Britain, and Ancient Egypt. Abbot Hall Art Gallery (housed in a Georgian villa), it mounts nationally important exhibitions, such as David Bomberg: Spirit in the Mass (17 July – 28 October 2006). Permanent collection includes George Romney, JMW Turner, John Ruskin, Ben Nicholson, Paula Rego, Lucian Freud, Stanley Spencer and Barbara Hepworth. Museum of Lakeland Life located in the original stables of Abbot Hall, it contains exhibits on farming life in the Lake District and a permanent collection of author Arthur Ransome's books and belongings. Kendal Castle, to the east of the earthworks, was probably built while Castle Howe was still in use. Friends' Meeting House is home to the Quaker Tapestry. The Brewery Arts Centre offers theatre, dance, exhibitions, cinemas, music, workshops, youth drama, dance, and food and drink. Lakeland Radio Stadium official football ground of Kendal Town F.C. Netherfield Cricket Club Ground is home ground of Netherfield Cricket Club and Cumberland County Cricket Club. The Queen Katherine Street drill hall was used to mobilize troops in the First World War. The Lakes International Comic Art Festival is held in Kendal every year in October. Matt Bigland (born 1985), guitarist and lead singer for alternative rock band Dinosaur Pile-Up. The Kendal dialect, known as Kendalian, is a variant of the Cumbrian dialect spoken locally. Kendal has long maintained a voluntary mountain search and rescue team based at Busher Walk. Its members have performed numerous rescues in the Kendal area, and along with other local mountain rescue teams helped at the Grayrigg derailment in February 2007. The Kendal Mountain Rescue Team is one of ten current mountain rescue teams that joined with Lake District Mountain Rescue Search Dogs and Cumbria Ore Mines Rescue Unit to form part of the Lake District Search and Mountain Rescue Association, an Cumbrian umbrella organisation. ^ http://www.thedesignworks.co.uk, Designworks –. "Kendal Town Council – Home – Old Market Town, Lake District – Kendal, Cumbria, UK". Kendal Town Council. Archived from the original on 13 April 2018. Retrieved 24 April 2018. ^ "Lead Dataset List". statistics.gov.uk. Archived from the original on 6 January 2014. Retrieved 22 October 2011. ^ Mills, A. D., Dictionary of English Place Names, Oxford University Press, 1998. ^ Linda Porter. Katherine, the Queen, MacMillan, 2010. p. 21. ^ David Shotter. "The Roman fort at Watercrook (Kendal)" (PDF). Archived (PDF) from the original on 23 September 2015. ^ Being a Relation of a Short Survey of 26 Counties, briefly describing the Citties and their Scytuations, and the Corporate Towns and Castles Herein. By a Captaine, a Lieuten[a]nt. and an Ancient, All three of the Military Company at Norwich. British Museum MSS. 34754, pp.19–20. ^ "Tim Farron". theyworkforyou.com. Archived from the original on 1 June 2013. ^ "Lake District National Park area map and South extension area" (PDF). Lake District National Park Authority. 2016. p. 2. Archived (PDF) from the original on 13 January 2017. Retrieved 11 January 2017. ^ "marine west coast climate – climatology". Encyclopædia Britannica. Archived from the original on 3 June 2013. ^ "Kendal Climate Guide". worldclimateguide.co.uk. Archived from the original on 21 February 2013. ^ "Industries of Cumbria – Footwear". Cumbria-industries.org.uk. 2 May 2003. Archived from the original on 14 October 2013. Retrieved 31 May 2013. ^ White, Anna (24 May 2014). "Meet the company behind our Remembrance poppies". ISSN 0307-1235. Retrieved 17 August 2018. ^ "Meet the Head". Queen Katherine School. Archived from the original on 10 March 2014. Retrieved 10 March 2014. ^ "David Starkey: Laughing all the way to the library". 8 March 2002. Retrieved 17 August 2018. ^ "Kendal – Castle Howe – Visit Cumbria". www.visitcumbria.com. Archived from the original on 15 March 2012. Retrieved 24 April 2018. ^ "Kendal". The Drill Hall Project. Archived from the original on 2 September 2017. Retrieved 1 September 2017. ^ admin@ldsamra.org.uk, LDSAMRA webmaster,. "LDSAMRA - Home page". www.ldsamra.org.uk. Retrieved 17 August 2018. ^ "Town Twinning". Kendal Town Council. Retrieved 24 August 2018. 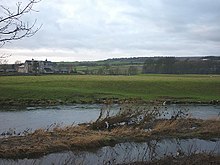 Wikimedia Commons has media related to Kendal. Wikivoyage has a travel guide for Kendal.